Oh, but the strawberries. So many big beautiful luscious berries. 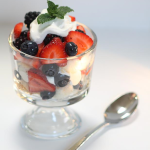 They would pass out giant bowls of split drop shortcake smothered in macerated berries and whipped cream. I seriously could never get enough and looked forward to this celebration every year. Lucky me, I now live in the land of strawberry heaven. Coastal California produces 88% of the nation’s strawberries and we get the first pick of the bunch. Chances are if you go to your local grocery this time of year, you will see Driscoll’s Berries which is one of the nation’s largest berry farmers. Strawberries are hand-picked and shipped within 24 hours to ensure the freshest possible berries get to you. To make sure you get the pick of the crop, ask your grocer when they will receive a shipment of berries so that you can get to them that day. I met with some friends last week at the Donut Bar in downtown San Diego and they had this oh-so-giant Strawberry Split Donut that was divine. 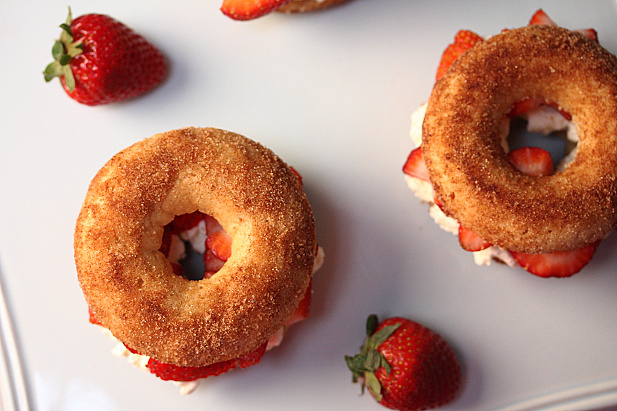 Cinnamon sugar donut, split open and stuffed with whipped cream and fresh strawberries? Yes, please. 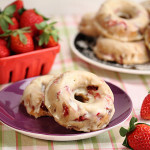 I immediately knew I wanted to recreate a baked version of this donut for National Strawberry Shortcake Day. Is it shortcake? 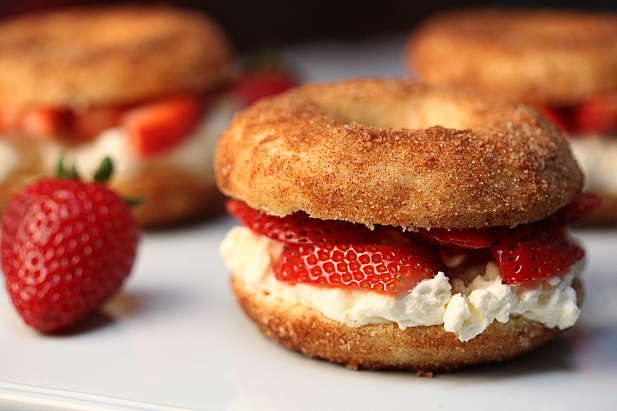 No, but it is a super light and fluffy cake donut that tastes very similar to shortcake when put all together. Trust me, you will love them. I have a husband with whipped cream all over his face to prove it. 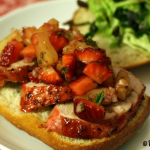 *Driscoll’s Berries provided me with coupons for their berries and a grocery gift card to assist in purchasing ingredients for this recipe. No other compensation was received and all opinions are my own. In a large bowl, whisk together the flour, sugar, baking powder and salt. In a small bowl or measuring cup, whisk together the buttermilk, vanilla, butter and egg. Pour wet mixture into dry and stir together with whisk just until combined. Transfer mixture to a pastry bag or plastic storage bag and cut off the tip/corner. Pipe the mixture into the prepared donut pan (or muffin tin). Tap the pan on the counter a few times to release any air bubbles. Bake 9-10 minutes or until donuts spring back to the touch. Remove and let cool 5-10 minutes. Meanwhile, stir together the cinnamon and sugar for the topping. Working with one at a time, brush each donut with the melted butter and then coat with the cinnamon sugar mixture. 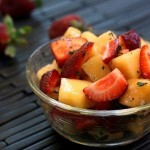 Place on wax or parchment paper to fully cool. Once donuts are totally cool, carefully split in half with a serrated knife. 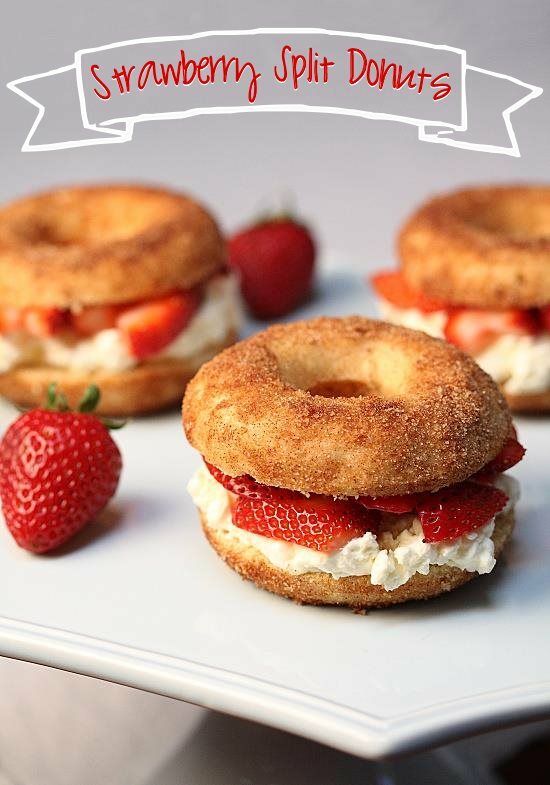 Spread some whipped cream on the bottom piece and top with the strawberries and donut top. Best eaten within 1 day. 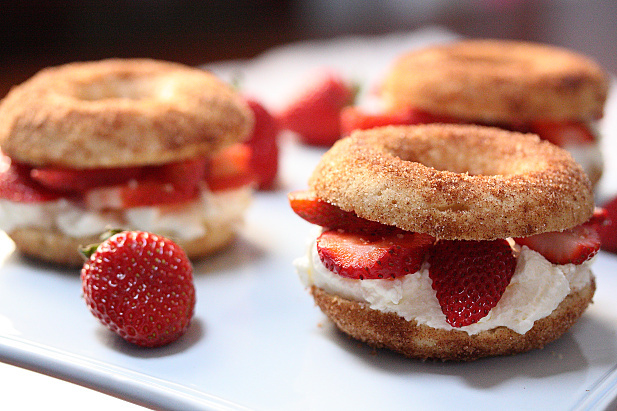 Oh my goodness those look fantastic! 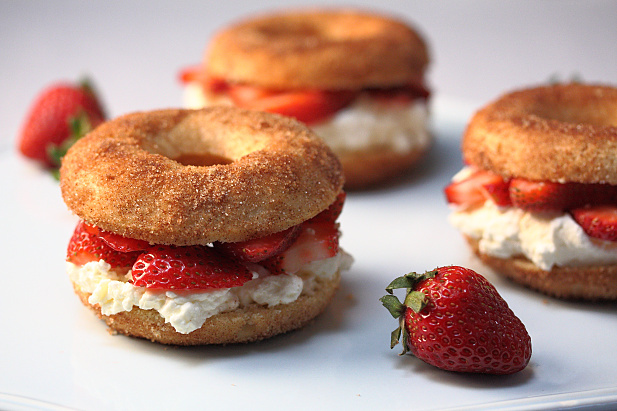 i’ve never seen a doughnut shortcake. this is amazing! Awesome!! Great job recreating the Donut Bar version. I really need to try this. Thanks, Brandon. Those donuts were so good!